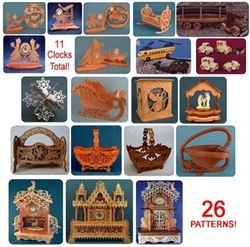 Scroll Saw Patterns Value Packs! Click here to get Back to Main Patterns Page. 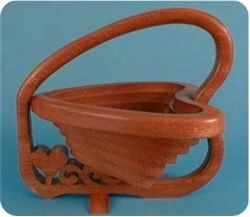 - Collapsible Heart Basket - Made from one piece of wood,it stands only 7"
- Swan Basket - curved bottom, standing 11" long. 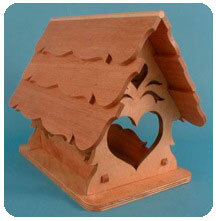 - Country Bird Feeder 9" long,classically slender bird feeder features country style. 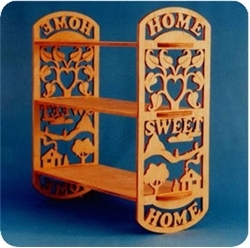 - Home Sweet Home Shelf - cherished collectible 15” high. - 5 Fendered Cars - Collection which is one of our most popular toy packs. unique...don't see too many wooden helicopters. LP-FPP Only $19.95 (Over $50 Value) 13 Projects! Guaranteed to Keep you Busy for A Long Time! You'll be hard-pressed to find a better deal on such varied, high-quality projects. . .for $39.95. Projects we've included are listed to the right, with brief descriptions. A HUGE collection containing 26 projects with FULL SIZE patterns! If you were to buy each one of these patterns individually it would cost you well over $100. It's the Best Deal on the Biggest Variety of Scroll Saw Patterns we've ever seen! 2. 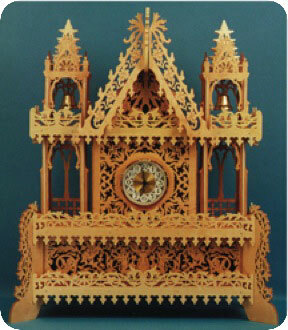 Bell Tower Clock, standing 23" tall and spanning 19" in width! 3. 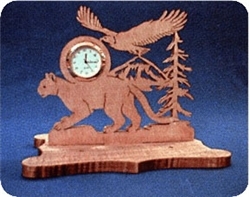 America's Pride Clock, standing 28" tall, it's 16" wide. 5. Tabletop Christmas Sleigh is a classic project. It's 11" long. 6. Angel Tissue Box Cover which is about 6" high and easy to make. 7. 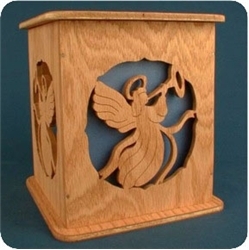 Nativity Music Box looks great on a table near your Christmas tree. 8. Pegasus Fruit Basket 11"w and features the mythical Pegasus winged horse. 9. Victorian Basket has a length of 16". 10.Swan Basket curved bottom, standing 11" long. 11.Collapsible Heart Basket Made from one piece of wood, it stands only 7"
12.Elk in Nature Mini Clocks - clocks in this packet use a 1 3/8" clock insert. 17. 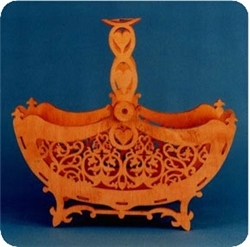 Mini Doll Cradle -- easily enlarged, or reduced for your preference. 19. Toy Helicopter Pack unique...don't see too many wooden helicopters. 20. 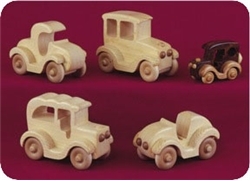 5 Fendered Cars Collection which is one of our most popular toy packs. 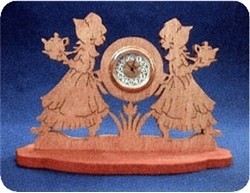 You get 3 projects here with FULL SIZE patterns for all scrollwork -- ALL of our patterns are full size. 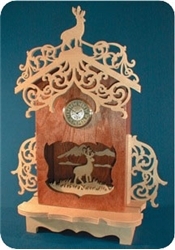 the clock itself, also featuring a deer within nature's scenery. standing 23" tall and spanning 19" in width! Just a beautiful piece which looks almost like a European church. Angels are featured in the lower box, with elegant scrolling dominating. standing 28" tall, it's 16" wide. You might have seen this in the late 1700's in a wealthy American home. Now revived with your scrolling skills -- sure to be an heirloom. You Get Four of our Most Popular Basket Patterns! You get full size patterns, plus a list of materials needed, exploded 3D diagram, plus some general scroll sawing knowledge about sanding, blade selection and lots more. - Pegasus Fruit Basket is 11" wide and features the mythical Pegasus winged horse. 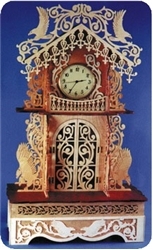 Scroll work also includes oak-like leaves, a shield motif, and Olde World foliage and vinage in the arcs. - Victorian Basket has a length of 16". A beautiful and classic piece featuring hearts in the handle and vines with small flowers on the sides. - Swan Basket standing 11" long. Cat tails and reeds frame the two love swans, while hearts continue the country or sweetheart theme. - Collapsible Heart Basket Made from one piece of wood, it stands only 7" tall, making it both cute and accessible by most scrollers. Folds flat. Great Toys to pass down from generation to generation. 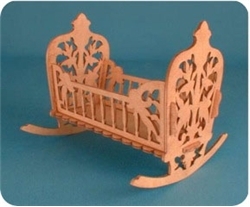 - Mini Doll Cradle -- easily enlarged, or reduced for your preference. - Wooden Log Truck a time-tested boy's toy sure to be an heirloom remembered. 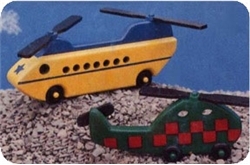 - Toy Helicopter Pack which is unique...don't see too many wooden helicopters. - 5 Fendered Cars Collection which is one of our most popular toy packs. Classics! You get full size patterns for all cuts plus a list of materials needed, exploded 3D diagram, plus a bonus segment of general scroll sawing knowledge about sanding, blade selection and more. 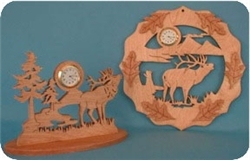 - Elk in Nature Mini Clocks --ALL clocks in this packet use a 1 3/8" clock insert. - The Boats Mini Clocks caps off this great value pack! - If you were to purchase these projects separately for download, you would spend about $25 -- this value is way over HALF PRICE, at $9.95. - Detailed Snowflake Ornament is 5" wide, beautiful, and can be stained or painted in a variety of ways. Sure to be one of "those" ornaments passed down from generation to generation. 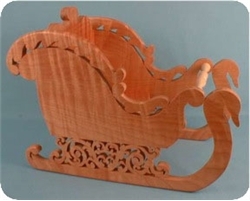 - Tabletop Christmas Sleigh is a classic project. It's 11" long and is great as a centerpiece for your table, or for knick knacks during the Christmas season. - Angel Tissue Box Cover which is about 6" high, easy to make, and a very nice addition to the household decor during Christmas. 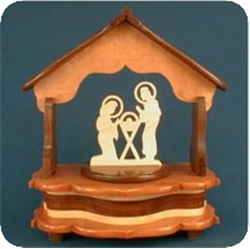 - Nativity Music Box looks great on a table near your Christmas tree, or in any part of the house. Find a movement with your favorite hymn or Christmas song and enjoy. -- As with ALL of our projects, you'll get full size patterns for all pieces, a list of materials needed, a photo of the finished project, exploded diagrams for assembly, a few shop notes, plus general scrolling info that will help you finish your project(s) and become a better scroller.